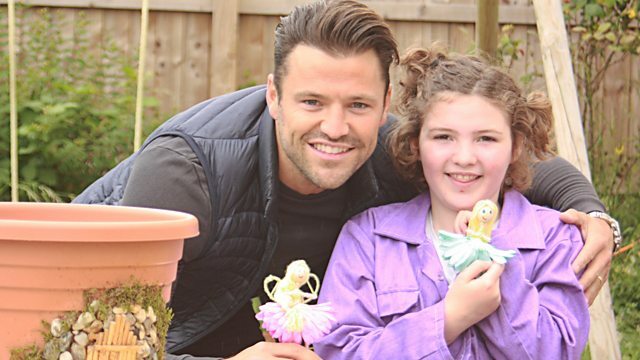 Mark and Lauren get the help of experts to design dream dens for children. Eleanor, ten, loves books, so the team bring the library to her - a magical library! Browse content similar to Magical Library Den. Check below for episodes and series from the same categories and more! -And this is The Dengineers. The show that puts you in charge of building your very own dream den. Hanging out with your friends and family. This den is the best thing ever. And dens built to fulfil your dreams. -It's more than he could ever have wanted. to transform your inspiration into amazing spaces. Hello and welcome to The Dengineers. In case you haven't noticed, we're in a library. Do you want to keep it down? We have to be quiet on this one. for a ten-year-old girl called Eleanor. so we're going to be building her a magical library den. -This is going to be unbelievable! So, we'd better get hidden. is ten-year-old Eleanor from Penarth, South Wales. and I have nowhere to go to do it. Eleanor loves to read and write. and she's writing a book. it's very difficult for her to do that. which affects her movement and means she has to use a wheelchair. would be the most fantastic opportunity for her. and having the den would give her somewhere special to go. where I could do all my reading and writing. Please come, Dengineers, because I really need your help. The Dengineers spring into action to rig our secret cameras. And they've even dressed up as librarians. She must be coming any minute now. She has no idea that we're hiding out waiting to surprise her. We've left Eleanor a very special message on a scroll. "if you turn your head and look behind?" your very own dream den. Did you ever think this was going to happen to you when you applied? -Well, guess what, you're not dreaming. -Look! You're here, it's happening. When I saw Mark and Lauren I just felt, like, over the moon. When Eleanor turned round I nearly cried. Watching her face, she was so happy. You're going to be building your very own dream den. It's just the most best thing that could ever happen to me. that can bring Eleanor's den to life. Eleanor, welcome to the Dengineers mobile HQ. onto the screen to show us how you want your den to be. where I can't get distracted by anyone. We don't want it to be just like a bog-standard library, do we? -We want it to be a magical kind of feel, is that right? you grab it, swing it up there, we'll have a look, shall we? -Looks magical as well, doesn't it? That's symbolling magic wand and mystery. So is that the kind of books that you're into? like witches and wizards and werewolves, and vampires. I like typewriting as well. It's like olde worlde, isn't it? Like they probably did in the old days. -Like I've used magic to go back in time. This den isn't just for writing but it's also for reading. I also want to include a tiny bit of magical nature. that's on the outside of the den before you go in? -So, tell us about fairies. I like how they perform good deeds and how they're so mystical. in my den so that it would be, like, an endless supply. I can imagine just chilling out, reading a book, feeling magical. -Is that how this is going to be? -I think we're just about done. Do you? Eleanor's mood board is full of ideas for her den. and a typewriter so she can pen her first bestseller. will be building Eleanor's magical library den? multimillion-pound buildings for a huge range of clients. She's got the magic touch that will bring Eleanor's dream den to life. Now, Maral, you've seen the designs. You've seen everything on the mood board that we want. and I've come up with a woodland theme den. so, maybe, some trees and tree bark, something like this. to access your den using your wheelchair. you can look through the windows and through these trees. -Do you give a thumbs up to my design? -I give you triple thumbs up. I don't think I've ever had a triple thumbs up! Maral has created a magical woodland theme for her library den. Eleanor will be able to get in and out easily using a wheelchair ramp. and a window, so she can be inspired by looking at her garden. the Dengineers must prepare the area where the den will go. If they can get in the garden, that is. so the team are going to widen the path. and a ramp for her wheelchair. and then it just smooths out like magic. Of course we'd use magical concrete. This is a magical library den, after all. I'm very happy that my den will be a big den. but now I've seen the size, all my fears have been dealt with. the foundations of Eleanor's den. All they need now is for the concrete to set. to start on the main structure of the den. And, when we rock up, we never travel light. As the team finish unloading the van, the heavens open up. It's like cats and dogs. But a bit of water never stopped anyone. The main structure of Eleanor's den has arrived. and Eleanor is in charge. can know what's going on except me. Now it's a Dengineers-only zone, that means I'm in the dark. and build something wonderful for Eleanor. the Dengineers are making the most of the dry weather. The den is flying up, with the floor and the walls in place. Inside the house, a special delivery has arrived for Eleanor. that you need in your library? -Well, I've got something to show you, then. A lot of publishers have given all these books to you. -For your magical library, yes. Would you like to take a look at some of them? Yeah. This is so amazing! I feel really lucky to have all these books. I'm going to be going forever. ..outside the team are racing to get the roof on in the dry. End of day one has gone very well. but, with the help of everybody, we even managed to get it on. Just in time, as the rain's just about to start. and I've got another exciting day tomorrow. I don't know how I'm going to sleep tonight. Day two of the build. to keep the build on track, including Eleanor. that Eleanor can access her den easily. a ramp is being built for Eleanor's wheelchair. when she opens the doors of her den. the team have created a landing section at the top of the ramp. to move her wheelchair backwards on when she opens the doors. so Eleanor can easily manoeuvre across the threshold into the den. has ever had - its very own fairy garden. And you can't have a fairy garden without fairies. -that looks a little bit like this. -Wow. Did you make that? onto the wire to make the head. Have you run it all the way to the top? -Brilliant. And then if you drop her hair. and then wrap them in wool. Do you like doing things like this, Eleanor? or because you like arts and crafts? She's got the technique going now, hasn't she? Look how quick she is. all that's left to do is get her dressed. I want to find out more about her passion for books from her mum. Where does the love of reading and writing come from with Eleanor? From a young age Eleanor's had a lot of hospital appointments. I'd make stories up, and she loved that. Eleanor's got a condition that's not been easy for her. but it just means that walking is difficult for her. But it's been more evident as she's aged that she needs more support. Why do you think this den is going to be so important for Eleanor? Why is it going to be so special? have far more independence than she's able to have. create her own world and her imagination can blossom. is just going to be outstanding. Outside, it's all starting to go wrong for the Dengineers. It's raining, yet again bringing the build to a standstill. The rain is really, really coming down. because we need to get this den completed for Eleanor. Fingers crossed it brightens up tomorrow. as Dengineer Clare gets a phone call she does not want to receive. -We don't have a floor! the supplier and won't be delivered today. to get everything finished in just two days. Fingers crossed for no more rain. It's day three of the build and guess what? which needs to be done before tomorrow. who have got to get the build back on track. Maral's come up with a great idea for secret storage. we are going to make a secret storage with an old book. by creating this secret storage within it. make sure you check with an adult first to find an appropriate book. keeping a few free for effect, and then leaves it to dry. It doesn't have to be very neat, because this glue dries clear. It's completely dry. I can't even flick through the pages. Maral measures the book, where the secret compartment will go. and start cutting the pages. It's important to do this very slowly and gently. make sure you get a grown-up to help you if you want to try this at home. Maral secures the sides and any loose pages with glue. and then cut it out to complete the secret compartment. where Eleanor can keep all of her treasures. to get Eleanor's den done in time. until the big reveal tomorrow. So I've got a surprise in store that she's going to absolutely love. -How are you guys feeling today? Are you ready to see the place where books are brought to life? -Let's go, shall we? Come on. Have you ever seen so many books? and has sold over 35 million books. OK, you can come in now. -Do you know who I am? Did you know I was coming? Eleanor is an aspiring author. Have you got any tips and tricks for her? because it helps you see how other people write their stories. It makes your imagination blossom. And it's good fun. Do you keep a diary at all? even when you'd much, much sooner be doing something else. So many people think you just get this wonderful flash of inspiration. That happens to me about once a year. Mostly it's just hard slog, get writing. And if you suddenly decide, "No, this is rubbish," don't worry. Stop doing it, write another story instead. When I'm writing my books, I usually do, like, three paragraphs a day. I happen to have read one of your stories. I have read The Button-Eyed Dragon. that Jacqueline has read one of your stories? Yeah? This is a bit of a dream come true, really, isn't it? -And you've had some tips and tricks as well. And, Jacqueline, what do you think of the idea for Eleanor's den? I think it's a brilliant, brilliant idea. a special den like that when I was your age. It's been an absolute pleasure meeting you. You're welcome. It's been lovely to meet you too, Eleanor. I think you're very lucky. -I'd like a writing den, too! I thought I was just going to see how they make the books. Not actually meet an author. "Oh, my gosh, oh, my gosh! It's Jacqueline Wilson." and hyper and I was like, "I never thought my day would be this good." a signed copy of Jacqueline's latest book. Back at the den the team are way behind schedule due to the rain. before the big reveal tomorrow. And it's proving a bigger job than they thought. it's an early start for everybody. She is going to love this. we need all the windows wiped clean, please. Come on, Mark, it's a team effort. -What do you think this is for? and they're all looking forward to seeing her den for the first time. to indulge her passion for reading and writing. where Eleanor can read and write in peace. and a specially created fairy garden for inspiration. But will Eleanor be enchanted by her magical library den? Guys, are you ready to see Eleanor's den? Look at the little fairy doors. I'm impressed with the ramp as well. How are you feeling, Eleanor? What's your favourite thing right now, that you can see? Have you seen the fairy that you made? Sitting on top of the sign. -I can see her, yeah. -Everyone else, what do you think? And it looks lovely in my garden. Right, Eleanor, shall we go in and have a closer look? -Come on, let's go for it. -Mum, we'll see you in a bit. -We'll see you in a bit. Let's go. Eleanor's magical library is packed with everything she needs. Even a secret fold-down writing desk with a hi-tech typewriter! It's my own writing desk! -Do you want a closer look? -And you've got an old-school typewriter. It's actually got a tablet and a typewriter system in it, as well. Take a little look at this, as well. and nobody even knows what's going on. And, Lozza, while you're on that note, check this out. -They look like library books. ..and it's a secret drawer. and a memento of the day Eleanor met her hero. We had such a good day that day, didn't we? to remember all the fun we had. on a bean bag, get yourself nice and comfy and tuck into a good book. -So, Eleanor, is it everything you dreamed of? Well, I hope that one day you'll pen your very first novel right in here. Your task is to get Mark and Lauren somewhere within your first book. -You could be witches and wizards. I will take a witch. I'll take anything, to be honest. is show Eleanor's friends and family the den. Come on, guys, in you come. -Look at all those books. Let's leave them to it. -We'll leave them to it. Have fun, guys. and I just got all excited and tingly. I feel like we are going to keep finding amazing things. How are those books there? and I think lots of friends will be coming over. and I'm going to do what Mark said, make the book with them in. Nothing is what it seems in this place. has just made it so worthwhile. Imagine these stories you're going to write with that. of bringing Eleanor's ideas to life. just makes me so happy and I know it will make her happy, too. Mark and Lauren get the help of experts to design dream dens for children. Eleanor, ten, loves books and the local library is her favourite place to hang out. But Eleanor has cerebral palsy which means getting out and about can be difficult - add to that her two lively younger siblings and it is nearly impossible for Eleanor to get to the library when she wants. So, the team brings the library to her. A magical library!